For centuries, biologists and paleontologists have classified animal species based solely on their appearance and anatomical differences. Astronomers do the same thing when they look at photographs and classify galaxies into the elliptical, lenticular, spiral, and irregular classes. The starburst galaxy NGC 1961 has one bright spiral arm wrapped tightly around the nucleus. 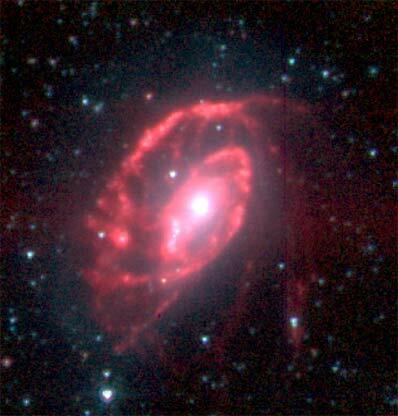 This Spitzer Space Telescope image uncovered many fainter arms, giving the galaxy the appearance of a nautilus shell. Red knots of warm dust mark the birthplaces of new stars, which are forming at a rate more than 10 times higher than in the Milky Way. Modern biological research has undergone a revolution by going beyond appearances to classify species based on their DNA similarities. Modern astronomy appears poised for a similar revolution. 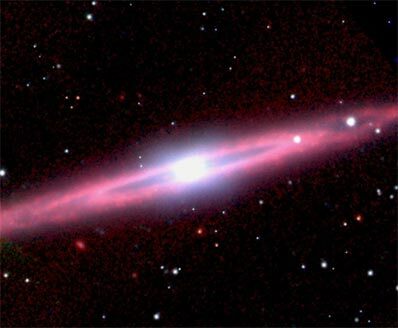 At the 204th meeting of the American Astronomical Society in Denver, Colorado, astronomer Michael Pahre (Harvard-Smithsonian Center for Astrophysics) and colleagues presented new ideas for classifying galaxies based on infrared observations by NASA's Spitzer Space Telescope. Elliptical and lenticular galaxies have lots of stars, but little dust or gas, and hence no current star formation activity. Spiral galaxies, on the other hand, have both stars and interstellar gas and dust, and they are continuously forming stars. The starlight in the images released appears blue, while the interstellar dust emission appears red.